Each USB port on the cards can supply up to 7.5 watts of power and operate at Gen 2 speeds, enabling file transfers up to 10 gigabits per second. An attached SSD for instance can transfer files at 800 megabytes per second, or up to 1.2 gigabytes in conjunction with three other drives. To use the cards most Mac owners will need an enclosure, but they should work directly with pre-2013 Mac Pro models, which some people have kept alive through upgrades. Neither card requires a power lead supplied from inside the unit, which many inexpensive cards demand. Apple is working on a modular Mac Pro for launch sometime year, which could potentially support PCIe 5.0 for faster speeds while maintaining backwards compatibility. Sonnet is selling both cards for $149. At Amazon the USB-C card is the same price, but the USB 3.1 (Type A) version is slightly cheaper at $137.57. Cards like this seem like a blast from the past, especially with that L-shaped design. Not Mac-like at all. This isn't for ``a Mac'', but for any PC with an x4 PCI slot that can take advantage of Thunderbolt inside their operating system's kernel. In short, for macOS, Linux, Windows, FreeBSD, etc. Slow down sparky. 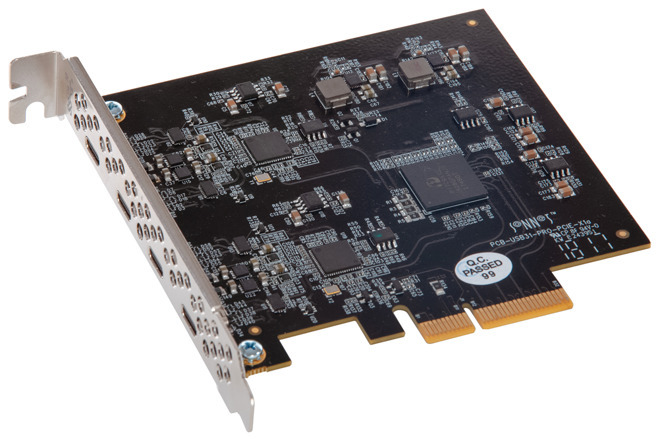 The Mac Pro upcoming will work with PCI-E 4.0. PCI-E 5.0 won't show up for another 3 to 5 years. AMD is the first CPU vendor to support 4.0 coming out this June on their next 7nm Zen2 CPUs. Those Zen2 will be backward compatible with the AM4 chipset and forward compatible with the AM5 chipset that will be the PCI-E 4.0 based motherboards.